Every time their DNA gets replicated, it gets shorter. 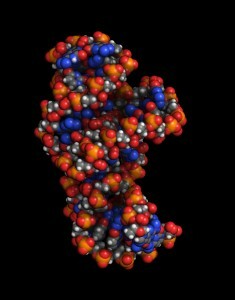 This is due to the fact that DNA polymerase can only add bases to the terminal 3'-OH of a DNA chain. The DNA replication initiation complex uses RNA primers to provide the initial 3'-OH and to initiate "lagging" strand synthesis. While one strand can be copied all the way to the end of a chromosome, the other, lagging strand, must be primed at short intervals in order to provide a 3' OH group for DNA polymerase as the replication fork advances through a chromosome. 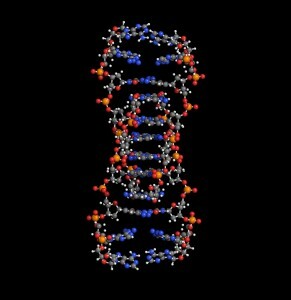 The problem at the end of a chromosome then is that the lagging strand has nothing for the primer to bind to. Without some kind of solution, each replication cycle would result in a shorter chromosome. Telomeres solve this problem. 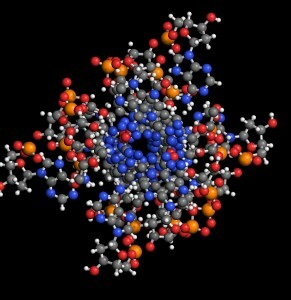 And, their molecules have cool structures. 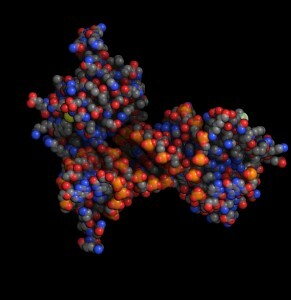 My recent post on DNA structures inspired an entire group of students to ask questions and comment. Some wanted to know about additional kinds of DNA structures that occur in the natural world. Telomeres are one kind of example. They contain short segments of repeated DNA sequences and were first observed by Elizabeth Blackburn in 1975 . 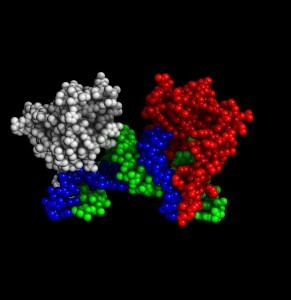 The repeated sequences can form quadraplex (4-chain) DNA structures, but the significance of their role in maintaining chromosome length was not understood until 1984 when the telomerase enzyme was discovered. Some NMR solution structures of Tetrahymena telomeric repeats are shown below. 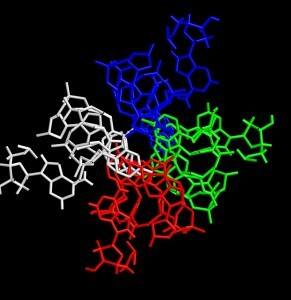 NMR solution structures from telomerase RNA from Medaka are shown below . The pictures were made with Molecule World on the iPad. 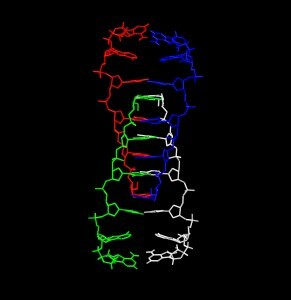 If you want to see these structures for yourself, you can find Molecule World in the iTunes store. 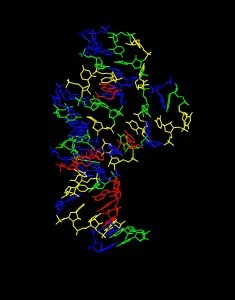 This post was originally published at Discovering Biology in a Digital World.